I just had one of the most touching human encounters I have ever had. In the most common of places - a waiting area outside a restroom at a local restaurant. I had just come from my car where I'd been listening to more news coverage (NPR) about the many shootings of young black men there have been. About the Black Lives Matter movement. About race relations in this beautiful, but still broken, country of ours. Waiting with me was a young black woman I did not know. With so much in my heart and on my mind - for all the far too many victims of gun violence in our country - black, white & brown, young and old, gay and straight, and all their families - I decided to reach out to this woman. To have a conversation. To hear her perspective as a black woman in my town. I asked her if I could ask her a personal question. She said yes. So I asked her what her perspective on our local police department was. She hesitated a little, unsure of what my motive was perhaps, then answered very politely - albeit carefully - that Lawrence seemed like a pretty relaxed place. She said she had grown up here in town and had never personally had any trouble with the police. She emphasized that she always tried to respect the law, when driving or otherwise. I asked her about the larger experience of her community and she reiterated that she had never had any personal trouble, but that yes, she did know of others who had. We chatted for a bit - and then she then asked me why I had asked her what I did. As tears welled up in my eyes, I told her that my heart was heavy as I heard all the reports of shootings - of young black men and policemen alike. I shared with her my concern for the situation at large, for everyone involved on both sides - the safety of everyone on our streets, of all ages and colors and duties. I expressed my concern and heartache for those young black men who had lost their lives too young and most of all for their families. And my equal concern and heartache for the officers shot in Dallas and their families. I told her that I had a son-in-law who was a white police officer and how when I heard about the Dallas shootings, I realized he could have been one of them. I told her I imagined the policemen in at least some, if not all, of the reported shootings must have felt fear - and reacted accordingly. But that I understood that does not fully justify what has been occurring - nor fully explain why. I told her I simply wanted to reach out to someone who might be on the other side, to learn whatever I could about what might be going on in my own community, to learn what I could from someone with a different experience, someone who surely had a different perspective than my own, so that I might see things with a little more clarity, a little more understanding. Tears streamed down her face. She spoke of her best friend, a young black woman who is a policewoman in North Carolina and how she feared for her safety. She spoke of her male relatives and how she worried about their safety, too. She spoke of her military service and all she had learned about safety and the preservation of life and how it grieved her that in at least some of the shootings it appeared that nothing was done to tend to the inflicted wounds and that she simply didn't understand how this could be. We both spoke of our concerns for how the reported shootings were occurring and the need for more police training related to how to diffuse a potentially volatile situation and/or to safely incapacitate someone perceived to be potentially violent, rather than shooting to kill. And how raw emotions were all the way around. I shared with her my belief that more than anything else, I believe we must all start talking to each other, reaching out across apparent divides to create understanding. I believe it is true that there needs to be a review of police training, and a greater emphasis on improving relations between police departments and communities. But perhaps even more than that, I believe each of us, as individuals, needs to start speaking to each other, across divides, with the deepest respect and compassion in our hearts for the other, for their experience and the experiences of their communities. To listen. To begin to mend the broken chords of our society. Wherever and whoever we are, we have this capacity. Then, with tears still streaming down her face, she asked if she could give me a hug. She thanked me for reaching out and said that at least for today, she had received some healing, increased hope, and peace in her heart. Thank you for listening. And thank you, Janelle, for having the trust and courage to bare your soul and share so openly and honestly what you did with me, a complete stranger, who now is your friend. At some point during my research into the common ground between yoga philosophy and Christian mystical traditions I came across this text from one of the Upanishads - sacred texts of ancient India. It is one of my very favorite pieces of poetry, so beautiful in its essence. It brought to mind the famous words of Jesus when he said, “I am the Way, the Truth and the Life.” and then a little further on in the same verse, “I am in the Father and the Father is in me… The words I say to you I do not speak on my own...it is the Father, living in me...” So many religions share this idea that all is One, that we are an embodiment of Spirit, and that that manifests when we are in alignment with the Source, God, the Way - whatever it is called in your spiritual tradition. My song “I Am the Way” was inspired by these two passages. It is simple in its form, beautified by the exquisite guitar and mandolin playing of Tom Prasada-Rao, with strings as the underlying support. This song is one of those that just came to me, floating by, falling from the sky - and I happened to be there to catch it. What it brings to mind is the beautiful Asian greeting, “Namaste.” My favorite translation of this now oft-used word is: “The divine in me bows to the divine in you.” Such a wondrously beautiful offering, this recognition that there is divinity within us all, that we are all so deeply connected. The song is a kind of chant, some might say, at least in the chorus. I sing, “You are my saving grace. You are my saving grace. You are my saving grace. I bow to you.” It has become one of my very favorite songs to sing, always taking me to a place of abundant gratitude - for all that is Divine and for all the ways it manifests - in people, places, Nature, all of creation. Every time I sing it, someone or something different comes to mind. Sometimes it is God. Sometimes it is a friend or family member. Sometimes it is the beauty of the Earth. Sometimes it is my cozy home, or my comfortable bed, or the beautiful oak tree in my front yard. Sometimes it is you. Which is why I chose it as the song behind the video for my Indiegogo campaign. It is my offering to you as you watch. It expresses my endless gratitude to you for supporting what I do. And just for being you. Tomorrow morning I’ll be offering both the message and the music at Unity Church of Lawrence. This is one of the songs I will sing. My mom will be there. I will sing it for her. And for all the people who have nurtured me across the years. But most especially for my mom for all the loving she does - of her children and of so so so many others. You’re the best, Mom, and such an inspiration to so very many people. Thank you for being you - and for being my mom. Wishing you all a beautiful tomorrow as we celebrate all the nurturing souls we have known - and most especially our dear sweet mamas. If you've been following these posts, you may have read my story about learning the Tara Mantra - and how singing it took away all the grumpiness I had been feeling that day - something I use often now if ever I need to lift myself up - and which I often now recommend as a panacea for whatever ill mood you might be experiencing. Truly, it is amazingly effective! I was in such a sublime place after learning the song - and had my viola in my hands - so I allowed myself a little dream time, just playing whatever came to me, improvising over the drone I had going as I was singing the mantra. Today’s featured piece - Tara - is what came to me. Tara is the second piece on the recording, a piece in three movements - mostly just solo viola over a drone. I named it Tara because it was inspired by the Tara mantra, even though Tara’s melody is not necessarily reflective of the mantra’s. Will I stand for love? Will I let my soul be one with you? Want to show your mama you love her in a unique way this Mother's Day? Write her a special note telling her you've got a special surprise for her for an upcoming holiday, then hop on over to my Indiegogo site (http://igg.me/at/CindyNoveloCD) and select one of the two 'Love you, Mom' perks I created just for this week. Yep, my Indiegogo campaign to raise funds for my new CD project ‘Meditation’ is still on. You all are amazing and I am so so grateful! We’ve raised $8700 so far - only $3300 left to meet my goal. And if you’ve not yet had a chance to contribute, I’d be so so grateful. A little while back someone made a very generous $2500 matching pledge, and there’s still a bit of that to be matched ($835) so if you donate soon you can still get in on this opportunity. Expecting this last little bit to go quickly, though! Just click the image below - and you’re on your way. I am going to spend this week sharing about the rest of the songs on my CD. I can’t tell you how much I love this music - and I honestly don’t know if the words I use here to describe them will do the songs justice. But I will do my best and at least can share with you some of the story behind the songs and what the songs mean to me. A couple of weeks I began this journey, sharing about the first piece on the CD - Hard Times Come Again No More. If you’d like to read that post, please visit the ‘News’ page of my web site - www.cindynovelo.com. Each day I will post about a new song, then move the previous post to my web site news. Today’s song feature is the Tara Mantra. A mantra is a word or sound which is repeated over and over to aid concentration in meditation. This beautiful mantra is from the Buddhist tradition. Tara, whose name means "star" or "she who ferries across," is a Bodhisattva of compassion who manifests in the female form of a young goddess. She is often depicted stepping off her lotus blossom throne out into the world where she will help sentient beings overcome fear, distress and anxiety. This beautiful mantra repeats Tara’s name in three forms, invoking compassion on the material, spiritual, and altruistic levels. I came across this mantra a few years ago as I was participating in a celebration of world religions at our local Unity church. I had been asked to provide the music for that morning’s service celebrating Buddhism. It was Saturday, the day before the service and I still had not prepared the music. I was tired and did not feel like working. But this is my work, so I dove in. In my research, I found this beautiful mantra, sung a cappella by a lone female Buddhist monk. I was transported by its plaintively evocative melody. I worked on the mantra for about a half hour, then sat down with my viola to learn the melody there. By the time I finished, I was no longer grumpy, my dark mood transformed by the beauty of the melody and the resonance of the words. I have often been healed by music… but this experience was more immediate and penetrating than any I had known before… truly and deeply powerful. For the CD I created two movements. The first is the sung mantra - which I call ‘Invocation’ - done in a very traditional and bare fashion so as not to take anything away from its essence - just a lone voice over a drone, subsequently joined by an additional voice singing the same melodic line each time the mantra repeats. The second movement - ‘In Reverence’ - remains true to the melody, the viola replacing the human voice. This mantra has become for me like a panacea, washing away all darkness, purifying me, healing me, whenever I sing or play it… It is my hope that this mantra will bring you the same peace it brings to me. I can't wait to share it with you! 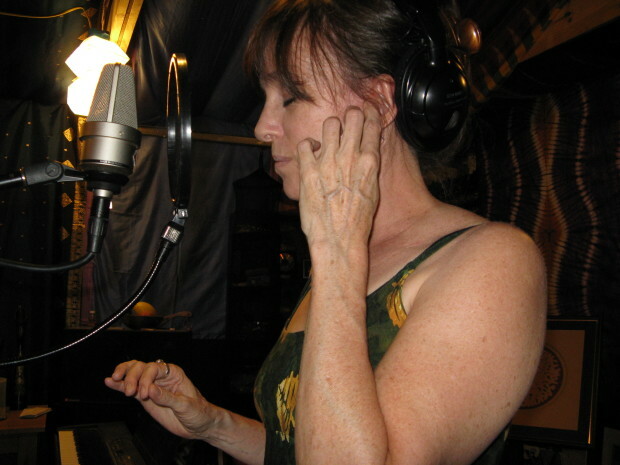 The first song I recorded for this CD - and the one that inspired the whole concept for the CD really - was Hard Times Come Again No More, a beautiful old song written in 1854 by the brilliant Stephen Foster. I've loved this song and wanted to do it for a very long time. But I had a new idea. I wanted to start it very traditionally, just solo banjo, as I'd heard it done a few times before. But then I wanted to start bringing in Indian instruments - tamboura, tabla - and play the melody on my 5-string viola, but with an Indian feel. My producer Tom Prasada-Rao plays the sitar, so I thought that would be fun to try, too. But when I shared my ideas with him, he said, "Cool. How about I start on banjo in a traditional folk mode, then move into playing the banjo LIKE a sitar?" That sounded intriguing! So that's what we did. And it's so cool! We ended up using banjo, 5-string viola, octave violin, drones, bodhran (an Irish framedrum), bells, kanjira (an Indian percussion instrument akin to the tambourine), udu (a Nigerian idiophone - actually a water jug with a hole in the side - usually made of clay), seed rattle, and majira (Indian finger cymbals) - and some vocals here and there. So fun!!! The piece ended up having 4 movements! How's that for taking an old song and making it into something new?! We LOVE it! And hope you will, too! It would never have become what it did without the brilliant input of my producer Tom Prasada-Rao. He's an amazing songwriter and multi-instrumentalist, too, as well as being an all-around beautiful soul. Check out his work at www.tomprasadarao.com. Good afternoon! Wanted to keep you all updated about the progress of my Indiegogo campaign. All is well! We've raised $6,700 of my $12,000 goal! And currently there is a matching gift on the table - with another $1200 to match. So if you haven't had a chance to donate, now is the perfect time. Or just browse my site to learn all about the project. Be sure to watch the video! Here's the url: http://igg.me/at/CindyNoveloCD. One of the things I'm doing on the site is introducing my songs and all the people involved in the CD. I'm going to post things on my Indiegogo site first, then move the posts here as a way to keep the whole story together. So here's the first installment. Enjoy! I began the recording for this CD in 2012, which is usually how it goes for me. I record over a long period of time. I was in the studio recording my song 'Deliver Me' for the re-release of my CD 'Stone's Throw' and had been conjuring up this idea in my head for a CD that would take traditional American folk tunes and put them over East Indian instrumentation. I'd been dabbling in East Indian violin music and could just hear it in my head. And, as providence would have it, my producer - a brilliant songwriter and multi-instrumentalist named Tom Prasada-Rao - just happens to be from India. How lucky am I! So I knew he would be perfect for his project. And his studio at the time - The Wildwood Tofu Bar in Dallas, TX - was beautifully draped in Indian saris from his family. So the setting was absolutely perfect as well. Here's a little taste of the studio (see my previous CD there among the others?) and a shot of Tom and I after a long, but very satisfying, day in the studio. More tomorrow! Sooo…. Here’s my big news! I’m getting ready to undertake my first ever crowd-funding campaign to support the creation and release of a brand new full-length studio album which I am SOOO excited about! Some of you who know me know I’ve been talking about all this for quite some time - and may have started to wonder if it was ever really going to happen! Well, it is! smile emoticon And I am really, really, really excited! I’ve set a launch date for the campaign for next Tuesday - one week from today. In the meantime, I’ll be creating a FB event for the campaign, just to get a little buzz going and help spread the word. Please, please join me there! (Coming soon - hopefully tomorrow! :)) No obligation at all, just a way to gather energy and light and get the word out there about what is coming. In the days to come I’ll be letting you know how you can help spread the word and get more involved in my campaign, if you wish! Thank you, thank you, thank you, thank you!!! I’m so looking forward to making this journey with all of you! More very soon! I'm super excited to tell you about everything coming up in November - and especially to announce my first overnight retreat! It will be taking place Nov. 7-8 at the beautiful and serene Osage Forest of Peace just outside Tulsa, OK. Osage Forest is an interspiritual contemplative retreat center that was founded in 1979 and inspired by the work of Bede Griffiths, a Benedictine monk who directed a monastery/ashram in India for many years, where Hindu and Christian practices were both incorporated. Very cool, no? So it's the perfect place for me to continue my work delving into yoga, the power of stillness, mysticism, and the crossroads between Christianity and yoga philosophy. And to share a bit of music, too. I'm hard at work on a new cd (coming soon!) called 'Meditation' that is very East Indian-influenced - so I'll be sharing some of that with you during the weekend as well. I can't wait! And now you get walk the path alongside me! Please consider coming! It's going to be good!!! And please tell your friends, share the attached poster, talk it up on Facebook, etc., etc., etc. Thank you ever so! Friday, Nov. 7 - Cindy Novelo in Concert: Music in the Sanctuary - 7-8:30 p.m.
Saturday, Nov. 8 - Yoga Workshop: Nurturing Body, Mind and Spirit - 10 a.m.-12 p.m.
Saturday, Nov. 8 - East Meets West: A New Perspective on Jesus workshop - 1:30-5:30 p.m.
AND I'll be on tour in Oklahoma for two full weeks, Nov. 1-13, so if you're anywhere near, come on out to one of my events/shows/performances. The main info is below. Please visit www.cindynovelo.com for full details. Thursday, Nov. 6 - Heart of Healing Workshop - Hopestone Cancer Support Center, Bartlesville, OK - 7-9:30 p.m.
Wednesday, Nov. 12 - Cindy Novelo at The Canebrake - Wagoner, OK - 7-10 p.m.
Sure hope to see you out there! And remember to come say hi! Oh, can it really be true that I've not given you new news since March? How can that be??? Well, maybe that's cause I've just been having too much fun enjoying what I do!!! What a lucky woman am I! A lot of my time since I made my last entry here was spent preparing for the wondrous tour to the Mountain and North West I did in August and September - booking, corresponding, preparing - and then going! I just can't even begin to tell you how glorious the trip was. Truly splendid, in every way. Inspirational. Full of adventure. Heart-warming. Fun. Delightful. Wondrous. And incredibly beautiful. I knew I would see beautiful things, but I didn't realize just HOW beautiful nor how much of it there would be. So incredibly amazing! I had music and books on cd to listen to, but mostly I just drove in silence in utter awe. It was like eye candy. I couldn't get enough of the view. I would drive leaning forward, looking this way and then that way, just soaking it all up. I was fortunate to have some days off in between my gigs where I could explore the land around me a little bit more. I hiked in the mountains everywhere I went, as often as I could. I camped in the mountains above Buena Vista, CO. In southern Washington, I hiked up the flank of Mt. Adams, way up above the tree line, very close to the summit. I hiked the Red Rocks in Colorado. I drove the historic Columbia highway, along the Columbia Gorge, hiking to Bridal and Multnomah Falls. I dined at the Kazakhstan Tea Room in Boulder, explored the wilds of southern Oregon, took a tour of Temple Square in Salt Lake. And on and on and on. And, then, of course, there was the music. A concert in a home with a view of the Rockies from every room where friends I've not seen in many years gathered. An outdoor show in the mountains on 100 acres off the grid outside of Medford, OR. A concert in a wondrously serene Mennonite Church in Arvada, CO. A house concert in a beautifully spacious studio with the most phenomenal acoustics I've ever experienced in an exquisite home tucked into the mountains of southern Washington with a view out the window of snow-peaked Mt. Adams. Church services and workshops in breathtakingly beautiful Coeur d'Alene, ID, forest-filled Federal Way, WA, and city-busy Denver. A bit of Indian music at Shanti Yoga Center in Vancouver, WA, the most beautifully decorated yoga studio I've ever seen. And many more, all equally wondrous, each in their own way. And of course, the people. I saw so many good friends, some of whom I'd not seen in years. So many stories and memories! And then, too, there were new friends made, all along the way. So many interesting and generous people there are in this world! Everywhere! And the hospitality! Oh, the hospitality! I could not believe my good fortune, so many people opening their doors to me, so many wondrous and love-filled homes, delicious home-cooked meals (and a few nice treats out, too!). So I thank you, one and all. I thank those of you who are reading this post, those of you who followed my Facebook postings and photo journal while I was out on the road, those of you who attended my shows, workshops and talks, all along the way, and most especially, those who worked behind the scenes to make it all happen, hosting events, housing me, feeding me, spreading the word and all. My sincerest, deepest, heart-felt thanks to you. I thank you from the bottom of my heart for all your support, your many good wishes, for coming out to my shows, for listening to my music - live or otherwise - and for all your most kind and heartfelt thoughts, prayers and words. Without you all, I would not be here. Without you, I would not be half as blessed as I am. Without you, Life would not be so very, very good. This has been such a wonderful and productive year. I am feeling better than ever - truly! - strong, vital, and supple. It feels so very good to be out there doing what I love and following this path that has been calling to me so very strongly. I've been touring a bit, teaching a bit, conducting a few workshops and playing as much as I can - old-time, traditional and contemporary folk, but also returning to my classical roots with The Oread Strings Quartet. (Check us out at www.oreadstrings.com). Just a few weeks ago, I completed my third module of a 4-part yoga teacher training certification program. I am happy to report that I felt stronger and more fit than I did the first year - pre-ovarian cancer. How about that! This has been an amazing journey. Last year while I was undergoing my chemotherapy treatments and unable to do much, I did a lot of writing about my experience. My cancer taught me so very, very much. I am truly grateful for it all. I'm hoping to spend more time in the year to come turning what I have written into a book which will most likely be titled "How Can I Keep from Singing?" It feels so right that I should use the title of this beautiful old gospel song. It captures how I feel so perfectly. The world is so full of beauty; each day I marvel and wonder, truly, how can i keep from singing? I also hope to dedicate a lot more time to songwriting this coming year... So many songs are calling me! Many in the works, quite a few very close to being done, just waiting for me to give them a little time... And then... back into the studio to record a new cd!!! In recent weeks, I've been hard at work on my web site. Finally got music uploaded and my calendar updated. Now for photos and more. Always a work in progress! Please come visit, anytime, and sign my guestbook while you're there. It's always a pleasure to hear from you! www.cindynovelo.com A Facebook music page is in the works, too! Coming soon! As always, I made my annual trek to the wonderful Walnut Valley Festival in Winfield, KS in September where I participated in a fabulous songwriting workshop with Still on the Hill, a truly inspiring duo from Arkansas. My song Stone's Throw was once again selected as an alternate in the NewSongs Showcase - 2 years running. It was entered in the "None of the Above" category which they keep saying is by far the most competitive category, so I am honored. Maybe next year? Also was invited to accompany the amazing and lovable Butch Morgan at WoodyFest in Okemah, Oklahoma in July. Even though the heat was on, I had a wonderful time, made lots of new friends in Oklahoma, giving house concerts in Locust Grove and Bartlesville. Simply sublime! The more I do them, the more I love playing house concerts. So if any of you - anywhere in the country - are interested in hosting one, do let me know. I'd love to come your way! Hope you will be able to make it out to a show soon. It will be good to see you all, each and every one. Thanks, again, to all of you for supporting me and music in all the ways you do. So much to tell! Just got back from 10 wonderfully glorious days in Oklahoma. Hot, hot, hot and dry, dry, dry, but fun, fun, fun! It all began with 4 days in Okemah at the annual WoodyFest gathering. So much good music, so many good vibes, so many good people. I played a set with The One and Only Claude Butch Morgan who rocked the house at The Brick. We ended up being a 5-piece band - Butch singing lead and doing his amazing guitar magic, Karen Mal on mandolin and vocal harmonies, Patrick Turnmire on his magic drum box, a wonderful bass player whose face I see clearly but whose name escapes me, and myself on fiddle and a bit of vocals, too. That Butch can really put on a show. He had the audience eating out of the palm of his hand before he even got through sound check. And what a wonderful sweet person he is. I thank the heavens above for arranging for our paths to cross. Thanks, Butch, for inviting me down to the festival to join you for this show. What fun it was! From Okemah I headed east to my friend Lance's who lives just outside of Locust Grove, OK, on a sweet little spring creek in a beautiful stone cabin. He's put such nice touches into his place that it feels like a spa. Got to relax, meet his friends, spend lots of time with my music, float in the crystal clear waters of the neighbor's private spring-fed swimming hole where I had a personal encounter with a mink. Got to lie in the water watching him tend to his home. He didn't seem to mind my presence at all and just went about his business. While we were communing a deer came down to have a drink as well. Turtles floating by. A dragon fly landing on my toe and sunning there for quite a while. Simply blissful. Then on Thursday night Lance invited a few friends over for a sweet little last minute impromptu concert. It gave me an opportunity to test out my new Fishman SA220 Solo sound system. Oh, what sweet sound it produces! Hallelujah and praise the lord. I'm grateful for all my new Locust Grove, Tahlequah and Tulsa friends. Such sweet people you are! Feels like I have a new home there in your little corner of this sweet Earth. Then on to Bartlesville Friday where I played to a sold-out crowd at my new and dear friends Linda and Dan Maloney's home, inaugurating their new abode with its first house concert. It was a sweet, sweet night! Many thanks to Dan and Linda for making it all happen and to Richard and Patty for their wonderful assistance and to all the good folks who came out to listen. Without each one of you the night wouldn't have been as sweet as it was! Just love that union of people, music and community. Thank you, thank you, thank you! I'm a happy girl! Hope to make it back to Oklahoma real soon! My good friends of The Prairie Acre have just released a new CD titled Roll Up Your Sleeves and I'm on it! Check out the last track - Pretty Betty Martin. I've gotten to perform this with them a few times and oh what fun it is!!! Just love this old-time band. One of my very favorites in the world. So much fun! Go to www.theprairieacre.com to purchase the cd - or catch them at one of their shows! Tricia Spencer (acclaimed fiddler for the old-time band, The Prairie Acre) and I have formed a duo! So much fun! Lots of good old traditional tunes, double fiddle, vocal harmonies. Sweet, sweet sweet! Had our duo premiere at Delaware Commons in Lawrence, KS, on May 21, then played a real fun set at The Bottleneck as part of the "From Lawrence with Love" benefit for Joplin, MO. We'll keep you posted as more gigs come up! In July I'll be off to Woodyfest to back up the one and only Claude "Butch" Morgan for his set on Saturday afternoon. Then a few days on my own little songwriting retreat (so many songs brewing!) at my friend Lance's beautiful riverside home near Tahlequah. Then a fun house concert at my friends Linda and Dan Maloney's in Bartlesville. And a retreat at Unity Village with Karen Drucker before that. So lots of good things coming in July! I'm also doing a bit of work with The Oread Strings Quartet, a classical string quartet. Playing lots of weddings. Such an honor to be a part of people's sacred ceremonies. So old-time, singer/songwriter, classical - all at once. Love, love, love it! It's my birthday - and I just got the best present ever! Just learned I'll be opening for the wonderful band RED MOLLY in August. Soooo excited! They are one of my very favorites bands on the scene these days. Friday, August 26, in Lawrence, KS, as part the wonderful WEST SIDE FOLK concert series. Sending you a note from New Mexico wishing all the world joy, peace, hope and light. May this day and all the days to come be full of grace for you and all your loved ones, near and far.